There are more and more 3D AVCHD camcorders come to market, after a few years, 3D video may take the 1st place of 2D video, what we see now is that 3D harware and camcorders technology speed up their steps, but unfortunately there are few 3D video eidtor & converter software to follow up harware steps. MTS itself already a big challenge in converting and editing, let alone 3D MTS. 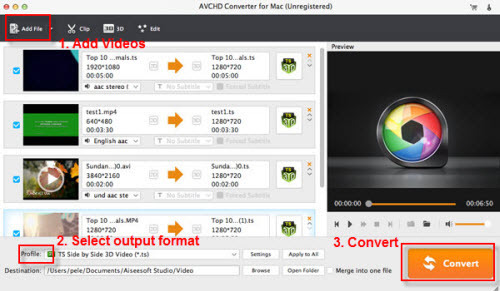 Many 3D camcorder users get annoyed in editing 3D MTS, to meet the requirement, we developed this software, UFUWare 3D AVCHD Video Converter or 3D Video Converter for Windows or Mac. Not perfect enough, but this UFUWare 3D AVCHD MTS converter can meet the most people’s basic need. with it, user can convert 3D MTS to 3D AVI/WMV/MP4/DiVX/MKV HD video formats, and 3D mts to general 2D video formats for the convenience of view or playback it on your iPad, HDTV, Apple TV, Google TV and other traditional general 2D video Players (software player and hardware player). it support import the source mts videos directly from SD, SDHC, MS and SXS card. support drag 3D mts from local files or click “add file” button to add 3D MTS videos. 2. Select the video format you want to save as. You can choose general 2D video formats, devices compatible video formats, editor software compatible video formats, HD video formats and 3D video format as output video formats, All these options can be done under “Profile” option. For 3D video, it support convert 3D MTS to 3D MP4, MKV, TS, AVI, FLV with the form of Side by Side 3D video and Top and Botom 3D video. 3. Click “convert” button to start convert 3D MTS. This article is just a brief operation guide on converting 3D mts, ofcource, you can do some editing jobs, such as add water mark, add audio track, subtitles to the source 3D MTS, all of these operations are easy to realise, for more information about this 3D MTS converter, please try it by yourself, it is free of trial.